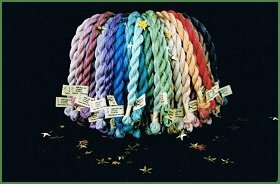 Each dye lot is unique and some variation may occur, so carefully calculate quantity required and allow of a little extra. As with all embroidery, care needs to be taken with your finished work. Our threads are not guaranteed colourfast, but problems rarely occur. Consultation with embroidery teachers and retailers suggests that if washing is necessary, do so in tepid water using pure soap only. Roll in a towel to remove excess water and dry flat. Press on wrong side using a dry iron. If running occurs - more likely in darker silk shades, do not allow embroidery to dry. Run cold/iced water through the affected area until water is clear. Please note that hot water, steam and most detergents/cleaning agents may reactivate dyes and cause bleeding.